Yup. It has happened again. Summer screamed by, and all of the things I meant to do relative to the flock (relocate the manure pile, enlarge the pen, add a new gate) didn’t get done. Now it is a mad scramble to get all of the pre-winter preparations done: top off the wood pile, pick low-bush, stock the freezer with moose and ducks (if you are a hunting sort) winterize the car, and clean up the yard. If you decided last spring to maintain a small flock of laying hens, then your fall chores will include preparing your coop for winter. Now is the perfect time to do some henhouse cleaning, not to white-glove standards but enough to keep your birds healthy through the long winter ahead. It’s also a good idea to set up all of your lights, water heaters and heat lamps ahead of when the light disappears and the mercury drops well below freezing and stays there. The following is my fall checklist for my coop, which is home to a dozen birds. It usually takes me two hours to complete. 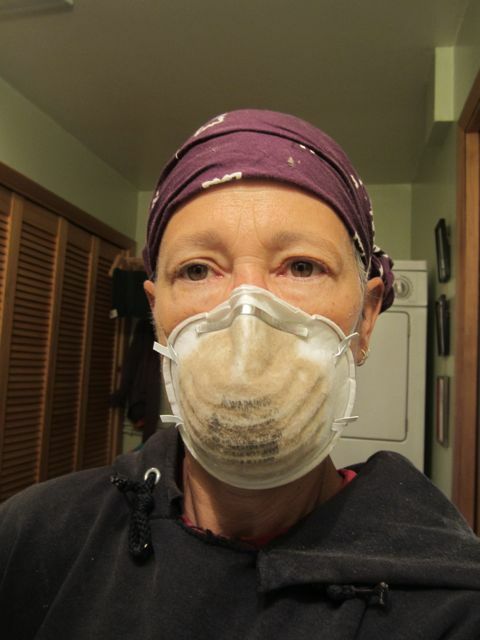 When I clean inside the henhouse, I wear a dust mask (the inexpensive white ones sold in hardware stores) to avoid inhaling the dust from litter and droppings. Why a dust mask is essential! 1) Muck out the outside pen to extend its life and mitigate smells next spring thaw. If you do not free-range your chickens, your flock has been spending most of its outdoor time in this enclosure, so droppings, food remains and used litter build up. I generally use a pitchfork to take off several inches, focusing on the areas beneath perches. This is also rich compost material (let it age at least two years before application). Every few years (this is one of them), I truck in a load of sand and spread it over the pen to a depth of several inches. You can also use pea gravel, but sand is cheaper; it also compacts well and I like it because it keeps the old muck from migrating back to the top. 2) Clean all roosts and ramps with a wire brush. A metal spackle knife is useful to remove dried-on chicken manure. If you are particularly energetic and own a pressure washer, you can remove roosts and ramps and give them a serious cleaning with relatively little effort. Note bene: it is particularly important to do this in a way so as not to be in the path of the pressure washer spray, and to make sure you have put the items well away from anything you dont want covered in wet chicken poop. Do not pressure wash inside your coop – it will take forever to dry. 3) Wash down the inside of the henhouse with a dilute bleach solution (1 capful to 1 gallon water; for chickens, more bleach is NOT better and may be harmful). This both disinfects and removes accumulated dust. 4) Remove all litter from henhouse, especially in nest boxes, and sweep it out thoroughly. Replace with clean litter. Make sure all litter – whether straw or wood shavings – is dry when added to the henhouse. 5) Move feeders and waterers inside the henhouse. If you heat your henhouse solely with a heat lamp, it is advisable to use a thermostatically-controlled water heater under your chicken waterer to ensure the water stays thawed even during extreme cold spells. 6) Check heat lamp and bulb, make sure they are operative, and clean both the fixture and bulb of accumulated dust. 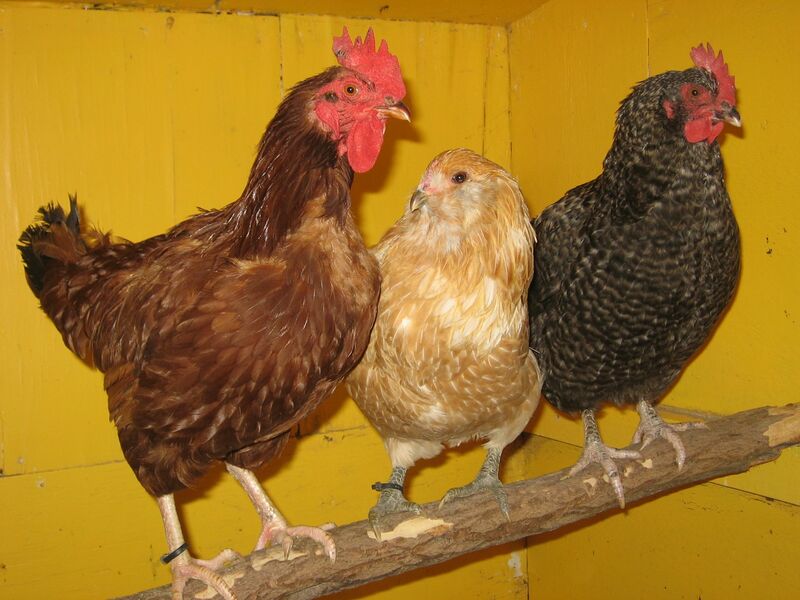 7) Set up an additional light source (a 40 or 60-watt bulb is sufficient), with timer, and begin giving chickens two to three hours of light in the evenings, depending on the number and orientation of windows in your henhouse. The amount of artificial light you give your chickens will steadily increase (up to 14 hours) as our natural daylight decreases. 8) Finally, leave your small coop door open until your chickens no longer go outside. Then close it to conserve heat and to prevent chills. If this is your first season with laying hens, expect some upheaval in flock dynamics as the weather cools and the chickens spend more time indoors. First-year pullets born in spring generally start laying about October or November. However, the onset of egg-laying may be delayed due to the rapidly-declining temperatures and natural daylight here in Interior, as well as the increased confinement. Making sure your flock has at least 14 hours of light throughout the late fall and winter will help keep pullets laying well through an Alaskan winter. This entry was posted in Equipment, Flock, General, Winter and tagged coop, coop maintenance, flock, flock health, winter, winter preparations. Bookmark the permalink. Getting our coop and pen ready for winter is on the list of chores for this week end. We have kept chickens for about 7 years now. Thank you for maintaining this blog on local chicken care and adventures.